+ Near the borders of New Mexico and Mexico, in the western corner of Texas, sits the city of El Paso. The city has a colorful history, access to the Rio Grande, and a plethora of things to do for people of all ages. Then there are people that specifically travel to the city to visit places they believe are haunted of course! There are a number of haunted locations in El Paso. Many ghost hunters feel that the Concordia Cemetery is one, if not the most, haunted of them all. With more than 60,000 people buried at the cemetery, there are bound to be a few still hanging around the place. People who love to visit cemeteries or are avid ghost hunters have not been completely disappointed at the Concordia Cemetery. Many people who have visited the cemetery, have either seen shadow people while there or have caught them with a camera. Other people have witnessed the presence of ghosts around the cemetery. The El Paso Playhouse is one of the spots on this list with consistent paranormal activity. The building was a church and the Festival Theater prior to becoming The El Paso Playhouse, roughly 50 years ago. Over the years the building has been the Playhouse, it has had more than its fair share of paranormal activity. There have been claims of people hearing whispering near the concession and spotlight areas. In the woman’s bathroom, toilets have flushed when nobody was using the facilities. Footsteps on the wooden staircase, as well as props and other things being randomly moved, has happened a number of times. Paranormal investigators have captured EVP (electronic voice phenomena) recordings at the Playhouse as well. People speculate, that some of the hauntings are caused by a technician, who was killed in the building many years ago. 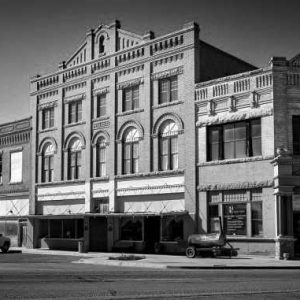 Back in 1930, a movie house was built for the town of El Paso. Years later it was decided to turn the building into a performing arts theatre. Once the renovations were done the building became the Plaza Theatre. Ghost hunters, patrons, performers, and employees of the theatre have all stated that they have experienced some sort of activity. There are claims that people in the mezzanine or who can view the area, have seen an unusual and somewhat creepy red-orange light. The ghosts that haunt the theatre like to play with the lights, turning them off and on. Not far from the center of El Paso, Texas is Fire Station #11. The big difference with Fire Station #11 and most other stations, is that this one is home to a number of ghosts. As one of the most haunted places in El Paso, even the firefighters have issues with the location. Some of them believe it to be so haunted, they refuse to sleep in the firehouse. There is one bed, in particular, that is so haunted, that firefighters will not use it. They prefer not to sleep in a bed that might shake in the middle of the night or have its covers pulled off! People love to visit Gravity Hill. There is something fun, about the illusion of your car going uphill on its own. When in actuality it truly is not. There are many people, who claim the reason the vehicles move up the hill on their own, is that Gravity Hill is haunted. The legend goes, that people making their way up the hill are doing so thanks to the assistant of spirits. They believe that spirits are pulling the vehicles up the hill. Skeptics believe it is a combination of gravity, optical illusions, and engine power, but what is really happening here? The Loretto Academy opened back in 1923. The Academy has a history of educating young women, as well as being the home to people who have died while at the Academy. One of the stories claims that a nun died after she had become very ill. Another story comes from a paranormal investigation team. They believe the nun killed herself, after finding out she was pregnant. Many people state that the spirit of the nun can be seen roaming around the bell tower on a regular basis. The nun has also been spotting peeking out from behind the bell, before vanishing and reappearing. Many of the students dare each other to visit the bell tower in hopes of seeing the nun. Some of the students state they never saw or heard anything. While others have heard the sound of a woman whispering and felt as though someone was watching them. The El Paso High School was built in 1916. It is one of the most haunted buildings in El Paso, as well as being the oldest high school in the city still in operation. Students have the opportunity to get an education and the chance to meet a ghost or two. deciding she could not carry on, she commited suicide. One claim is that she slit her wrists, before jumping to her death from one of the school’s balconies. A female figure has been seen multiple times jumping from the same balcony. There have been so many sightings of a ghostly mist on the balcony, that the school had it walled off. There is a photograph of the class of 1985, where people can see the blurry figure of a young woman with the rest of the class. Although it might sound like a simple error in the photograph, everyone stated that there was no one standing where the girl is located in the picture. Like many other haunted hotspots in El Paso, La Hacienda Restaurant has been used for many different things. Originally it was built as a home in 1850. Over the years it was transformed into a brothel, a stop for the stagecoach, and eventually the restaurant it is today. People come to the restaurant to have a nice meal, can sometimes encounter the ghosts of those, that either once lived in the building, when it was a home or were only guests throughout the years. Three young kids died in a river not far from the restaurant and people have encountered the grieving mother’s ghost at the restaurant. Perhaps the most haunted house in Texas! The Magoffin Homestead in El Paso. Former mayor Joseph Magoffin and his family lived in the home that was built in 1875. When the city of El Paso and the State of Texas made the decision, to purchase the estate, the remaining descendants of the Magoffin family moved out of the property. Unfortunately for the city and state, they not only purchased a historic homestead, but also the ghosts remaining in the building. Joseph Magoffin’s best friend and brother-in-law, Charles Richardson, died on the property in a rocking chair. People believe his spirit remains on the property. Like many ghosts at other haunted places, lights are toyed with, doors are opened and closed randomly. People claimed to see Uncle Charlie rocking in his chair at times. Other ghosts people have encountered on the homestead is a woman wearing blue. A woman wearing white Victorian clothing and a little girl are also spotted on the property. Sadly children have died in the building, so it is not surprising to hear their cries. The De Soto Hotel has been around for more than a century. In that time, many people have come to the hotel either as employees or guests. Some of those individuals, at least three, remain in the hotel from the other side. People have claimed they have been bitten, scratched, and touched while in the Hotel. A number of these claims have actually been documented. Other paranormal investigators have documented the presence of a spirit in the basement, via an audio recording. The voice almost sounded demon-like to those that heard the recording. Paranormal investigators have heard the whispers of a young girl as well as capturing a shadowy figure coming out of a door.